Now normally I would reserve reviews like this for December, as that's the only time it's really acceptable to be eating festive snacks, however today's product is an exception because it's so good that I just had to tell you all about it! These are currently in M&S amongst their new festive range, along with Maple Bacon Tortilla Rolls, Christmas Pudding Ice Cream (fancy!) Chocolate Orange Ice Cream (do want! ), Christmas Pudding Roulade and more besides like Salted Caramel Pinecones, Prosecco Caramels etc. For more goodies do check out my Instagram page! 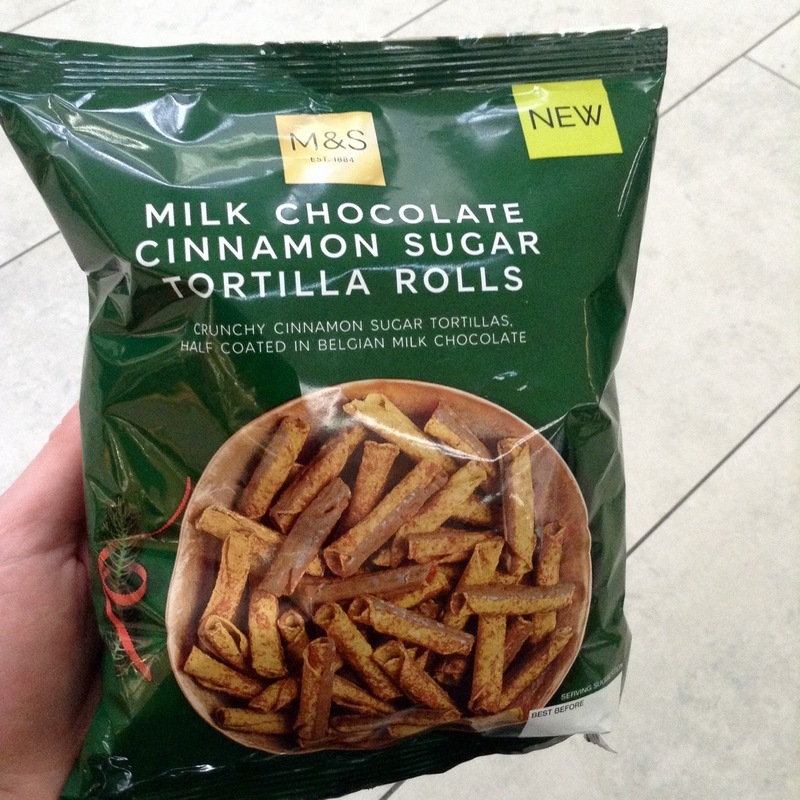 These particular snacks are selling like hot cakes - or hot tortillas - it seems; they're out of stock whenever I look in M&S. 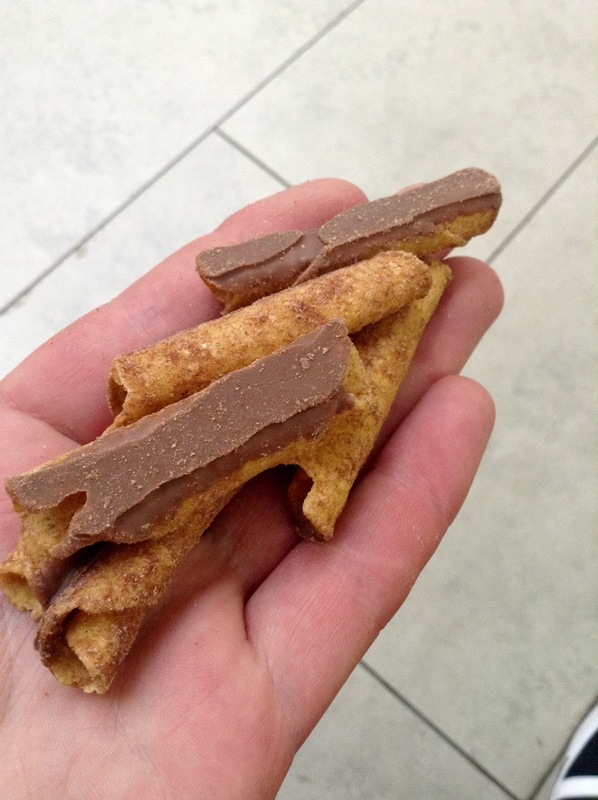 By chance I managed to nab the last pack on a flying visit to Glasgow, for a respectable £2 for 190g of "milk chocolate coated corn tortilla rolls with a cinnamon sugar seasoning". The milk chocolate is on one side of each roll and looks kind of chunky, with the cinnamon sugar more prominent on the other side. Some of the tortillas were stuck together in lumps, which is a good thing as it means you have an excuse to eat more at once! As I started eating them, at first I wasn't too sure. 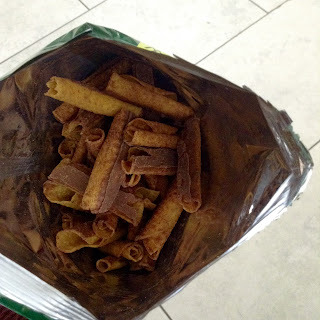 They tasted very savoury and I wasn't convinced that salty tortilla was a good thing mixed with sweet cinnamon. 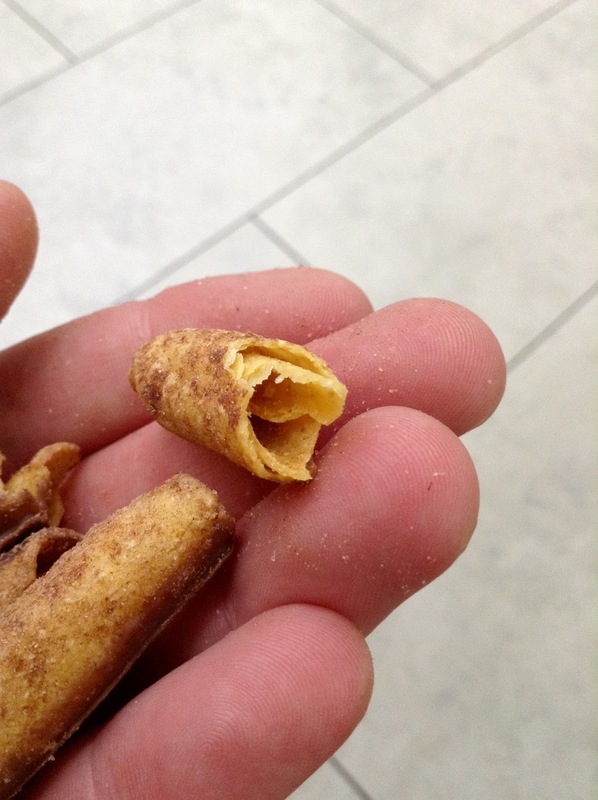 But as I crunched on them, they became more and more addictive, and soon enough I couldn't stop reaching for one after the other! They're so good! The combination of salty, savoury tortilla works beautifully with the cinnamon sugar, and the milk chocolate completes everything with a creamy sweetness. I would have liked more milk chocolate on them to be honest, as it's a bit lost in the cinnamon and tortilla flavours. These are just so good! Seriously moreish, very festive and sure to have everyone talking at Christmas. They're a must have on your Christmas list - stock up on them! And don't wait until Christmas either...they're ok to eat early because we are now in Pumpkin Spice season, and cinnamon is a pumpkin spice so...yeah. It's ok, no one will judge. Even if you do scoff the whole bag like I did...oops! Ingredients: Maize flour, coconut oil, belgian milk chocolate (20%) (sugar, cocoa butter, dried whole milk, cocoa mass, soya lecithin, vanilla flavouring), sugar, ground cinnamon, salt, flavouring, cinnamon extract, clove extract. Nutrition Information per 30g serving: 153 Calories, 7.7g Fat, 18.8g Carbohydrates, 3.6g Sugars, 1.3g Fibre, 1.6g Protein. Suitable for vegetarians.